Son, I dread the holidays. Well OK, you got me, I love the holidays. I just hate the holiday travel. At this time you probably don’t know why. I know that you probably hate being strapped into your car seat for hours on end as we go and see family, get used it. Once you become a parent, you will fully understand my hatred of holiday travel. Since you hate travel you make it difficult for your mother and father. We have come up with a few ways to help elevate the problem however that can only go so far. You can only take a nap for at most 2 hours, unless we give you bourbon, but something tells me that I would not be a good parent if I did that. You can only read the same book so many times and you can only play with the same toy for so long. I would hope that this year will be different. I would love to count the trucks as we drive and I would love to play eye-spy with you. Not only would this help pass the time but it would keep you entertained for at least an hour of our 6 hour tour. My singing obviously doesn’t keep you happy because you keep on screaming “DON’t DADDY” as I sing to you. Let me tell you son, that if you are pleasant in the car, it will make the trip go by much quicker and make mommy and daddy more pleasant to be around. I wish that there was a way to show you how much more fun we are to be around when you follow our directions but I can only practice what I preach for so long before I go insane. You do not get to see this side of the family that much and so at least I am excited about seeing them, your mother on the other hand might not be looking forward to seeing the in-laws, but what person likes seeing their in-laws right? I know that you will have fun because this is a Thanksgiving and Christmas for you! You will get to eat a lot of food, hopefully fall into a turkey coma, and play with the new toys that your grandparents will be getting you. 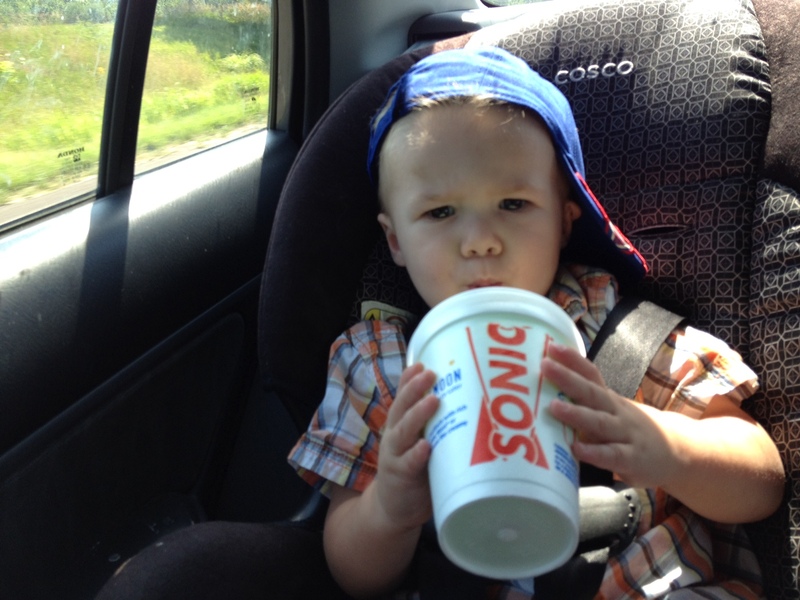 All I ask is for a nice quiet trip out there and back and maybe if you are good, I might get you a Sonic Slush. I have traveled once or twice with my son and I did it at night. He slept the whole way and it made things a little easier. I was tired the next day, but I didn’t have to listen to him scream for hours on end. Rookie Dad” mybloginfo with my own good friends on facebook. I personallysimply wanted to pass on ur fantastic writing!